Star Trek, Flash Gordon and Yellow Submarine aren’t exactly the sort of pop culture phenomenons one would associate with the refinery of Fiesta’s Coronation of the Queen of the Order of the Alamo — an opulent ceremony initiated in 1909 by “a group of patriotic San Antonio men who wished to enlarge Fiesta’s annual celebration of the heroic struggle for Texas’ independence from Mexico.” Yet in 1969, Coronation chairman Robert Morris selected a theme that embraced the groovy, outlandish aesthetics of sci-fi, space travel, psychedelia and pop art. 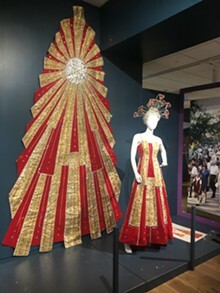 Titled the “Court of Time and Space,” the 1969 pageant enlisted local fashion designer, arts patron and onetime Coronation Duchess Margaret King Stanley to create elaborate garments and headpieces for 24 Duchesses, a Princess and a Queen, not to mention stage pages and other participants. 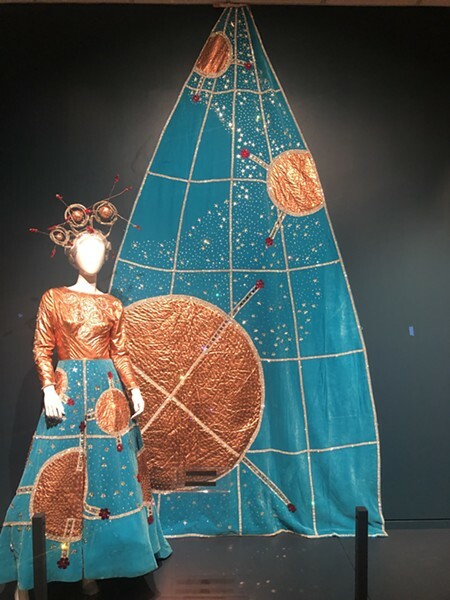 A far cry from the intricately beaded, impossibly heavy concoctions of Coronation as we know it today, Stanley’s imaginative designs relied more on the interplay of unusual textiles and embellishments to conjure visions of satellites, planets and galaxies far, far away. A longtime repository for Coronation gowns of yesteryear, the Witte Museum showcases these distinctly San Antonio creations in annual exhibits that typically employ themes to tie together styles spanning courts and decades. 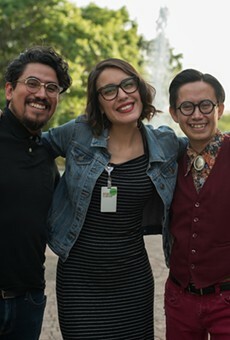 Marking an intriguing departure, the museum’s forthcoming “Blast from the Past: Fiesta 1969” turns back the clock 50 years to revisit a time when the world was fixated on space travel and all the future might hold. Boldly going beyond a collection of dresses on mannequins, “Blast from the Past” aims to create a time capsule of sorts via vignettes featuring vintage furniture, decor, photographs, video footage — including the 1969 Battle of Flowers Parade in its entirety — and objects chronicling San Antonio’s ties to NASA missions. “This court goes from the beginning of time and projects into the future, all connected to space and flight,” Chief Curator Amy Fulkerson explained in the Witte’s B. Naylor Morton Research and Collections Center. Does the Witte have many pieces from the Court of Time and Space? We’re going to have a mixture of different elements. We’re including the original designs that were drawn for the dresses [worn by] the Duchess of Psychedelic Visions and the Duchess of Spinning Satellites, [among others]. 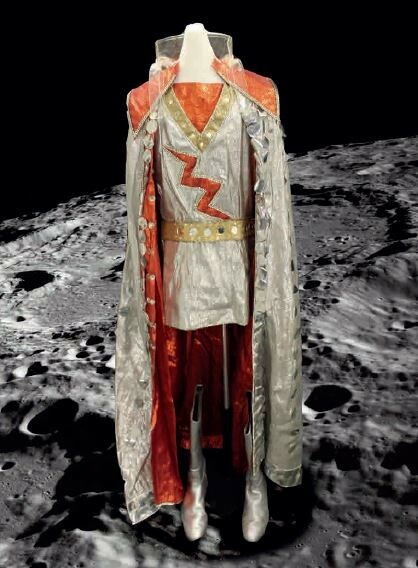 When the Mistress of the Robes, Margaret King Stanley, was given the assignment of a court that spanned all of time and space, she started doing a lot of reading and research, and the [design for the Duchess of Adventurous Astronauts] was actually inspired by Sputnik. And to think that this was in April of ’69, and that by June we had landed on the moon. [There’s also] the Duchess of Solar Energy, which at this time, solar power was being used almost exclusively by the space program. All of our technology for developing solar energy and solar cells was being used by NASA. And this is how they were powering satellites, it’s how they were doing life-support systems for our astronauts. We knew that we could capture solar energy but they hadn’t really harnessed it for the commercial market yet. Everything was about how to refuel the space program. Does the Mistress of the Robes sort of act as curator of Coronation? In this particular court, the Coronation chairman for the Order of the Alamo, Robert Morris, was the person who came up with the theme. 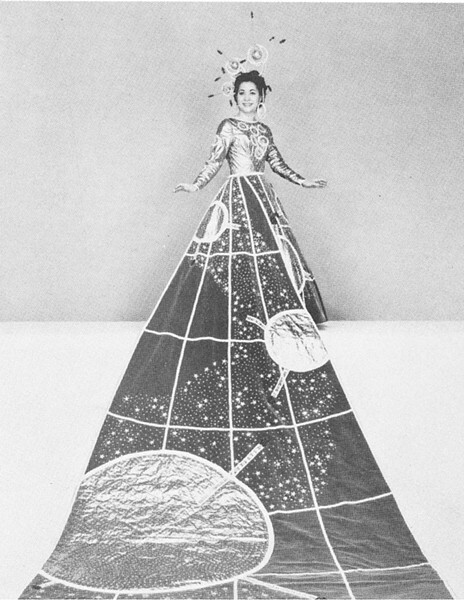 And he approached Margaret King Stanley about [designing gowns] for this particular court. She had about a year from start to finish, from Coronation to Coronation, to create the vision for what this court could be. … I think she did some really interesting things. I’ve been talking to the women who participated in the Coronation — getting their stories along with talking to Margaret about how all of this came to fruition. It’s fascinating. Margaret was telling me that her original design for the Duchess of Solar Energy included cellophane panels, strategically, so that light could go through and capture that essence of solar. But that idea got vetoed by the Duchess’ family. A little. She was ahead of her time. So she ended up creating panels using gold tinsel fabric. It sounds like it would be something on a Christmas tree, but it’s very geometric [and creates] texture and movement in the gown. These are pieces that don’t translate well from the page to life. So part of what we want to do with the exhibition is show this process that goes into moving something from design to reality — and getting to compare what these looked like in real life. And do you have all the headpieces that went with the gowns? We do and they are fantastic. They’re really remarkable. One of the things we’re doing this year, because it’s a bit of an anniversary and we normally don’t focus on a single court, is going back and talking to the women who were involved and capturing some of their memories. They’ve been sharing personal stories about their experiences and I’m incorporating that into the exhibition [in the wall text]. So each one of these will have a personal memory about the person who was involved. 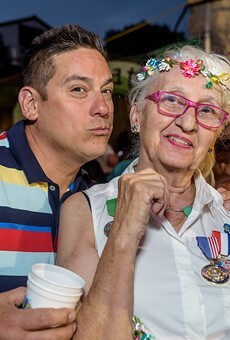 Like the Duchess who was the Duchess of Spinning Satellites, which our Fiesta medal is based on, she was talking about her headpiece, which was asymmetrical. It was more to one side of her head. And when they have to do that bow during the Coronation, this was so hard for her, because it was pulling forward and yanking her hair out. She was in so much pain. She shares this story about what it was to perform that bow with that headpiece on her head and how heavy it was and what that feeling was like. The idea is to put people into that moment … to imagine what it would be like to be the participant 50 years ago. The dresses themselves are traditionally very heavy. They are. And one of the things that happened in 1969 is that we actually get a change in design. It was the first year that they moved from the old silhouette with the very full skirt, they’d be wearing hooped petticoats underneath, to an A-line silhouette — which they’re still using today. The idea of going from the fashion of the early ’60s, which still had fuller silhouettes, to the late ’60s, which are moving in a completely different direction … to change that fashion in the Coronation was really sort of forward-thinking on behalf of Margaret King Stanley — to sort of radically change everything in one single year. So the gowns became lighter as a result of that? They are lighter. There’s less fabric. And part of that is because there are more elements that are being used that are defined by the fabrics, as opposed to being defined by beading or by rhinestones. … And textiles were a huge inspiration. So with the Duchess of Psychedelic Visions, one of the design inspirations was the work of Peter Max. And we have a Peter Max outfit that he designed for Wrangler. It’s psychedelic art from mainstream America. He was designing commercials for 7UP. This is something moving from the fringes to the mainstream in America. The Peter Max outfit was worn by Margaret King Stanley. [That and other vintage garments] will be in the exhibit as part of her design inspiration. If you’ve ever seen the Beatles’ Yellow Submarine, this notion of these bright, pop colors — the swirls and the patterns — are carried over in the designs. This is an element where pop culture has influenced part of the court, and makes it very relevant to what was happening in the time period. So we’re getting to play a bit more this year, and have fun with different themes that we don’t always get to address. Are there other garments in the show that aren’t gowns? One of the key figures in the Coronation was the Lord High Chamberlain, and he’s sort of the master of ceremonies for the whole Coronation. And he is wearing an outfit that is straight out of Buck Rogers or Flash Gordon. It’s got a wonderful little lightning bolt, and he’s got a ray gun, and he’s wearing this giant acrylic bubble helmet. … Once again, sort of tapping into what was happening in pop culture and what were the hallmarks when people think of that space — it’s science fiction versus science fact. Do you have photographs from that year as well? What can you tell me about how the gowns and other clothing will be displayed? They’re going to be on mannequins, but we’re accenting this [exhibition] with photographs and items from the time period to sort of capture that flavor of 1969. So we’re using a lot of the color palette and the graphic design that you would find in the 1960s. Our little nook where you can watch the Battle of Flowers Parade is complete with Eames chairs that you can sit in, with vintage pieces on the wall, as if you were watching this at home on television. We’re also doing video of contemporary pop culture at the time — this is when Sesame Street starts — and little clips so that people get a feel for the music of the time period. It’s all about not just showcasing the gowns, but [helping people] step back in time, and have a little time capsule of 1969. How did the Witte become a repository for Fiesta gowns? The Witte opened in 1926, and we were the first museum in San Antonio. And we became the repository for all of San Antonio’s history. And this was considered a part of community history. By 1926, [Coronation] had already been around for a while and so people started to donate pieces to the collection. The collection has grown to be more than 200 [Coronation] pieces. As we talked about before, [the gowns are] heavy, they’re elaborate, they have their own challenges with how we preserve and take care of them. And we have now said that we want to keep collecting, but we’re only collecting five gowns from any given court. We’ve set some limitations to make sure we don’t exceed our ability to care for these materials. [We also want to] recognize the artistry that goes into them. 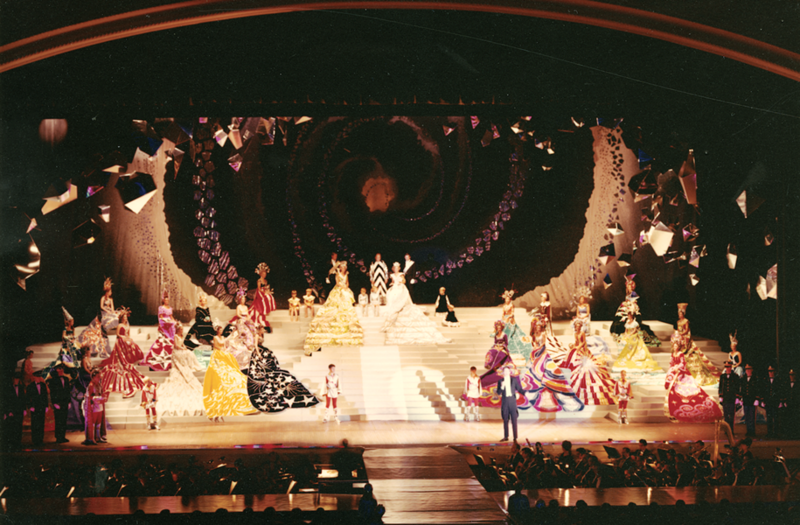 It’s not just the women who wear them during the Coronation, it’s the men and women who are creating them, the artists who are coming up with the design, and making that into a reality. … It really has risen to the level of couture with the more contemporary Coronations. The level of what they’re creating is just mind-boggling, how beautiful and detailed and skilled it is. And so we get to celebrate all of that, so that it touches many parts of San Antonio. There are many different stories that a single dress can tell. When: Wed., April 24, 10 a.m.-5 p.m., Thu., April 25, 10 a.m.-5 p.m., Fri., April 26, 10 a.m.-5 p.m., Sat., April 27, 10 a.m.-5 p.m. and Sun., April 28, 12-5 p.m.